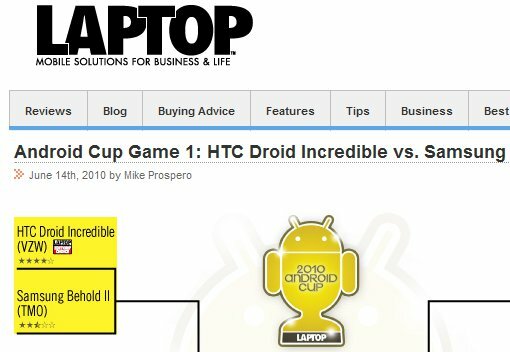 LaptopMag has put together another bracket style challenge of smartphones (Remember the March Madness of Smartphones?). This time the World Cup is the theme and Android smartphones were the only ones invited to the party. Should be good right? In the bracket you’ll see all of our current family members including the Droid Incredible, Motorola Droid and even the Droid Eris. Let’s see if we can push them all through! The first match-up is between the Droid Incredible and the Samsung Behold II; no contest right? Follow all of the action at LaptopMag’s official page.